Discover what is often unnecessary at work. Waste is everything you could remove from a system to get the same or better result. 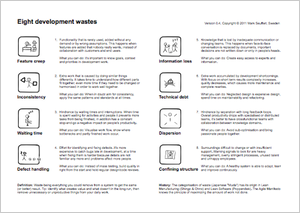 This document was developed in 2011 with companies in Sweden and shows a categorisation of wastes in software and hardware development. It should help you finding unproductive things, plus tips for removing them. History: The categorisation of waste (Japanese "Muda") has its origin in Lean Manufacturing (Shingo & Ohno) and Lean Software (Poppendiek). 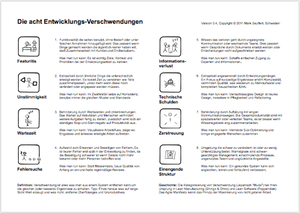 The Agile Manifesto knows the principle of maximizing the amount of work not done. Background: Productive systems create value and waste. Tip: Identify what creates value and what doesn't in the long run, then remove unnecessary or unproductive things from your daily work. Get support.